In the wake of the EPA mine water spill in Colorado a variety of groups are calling for rewriting the nation's mining laws and regulations. Kevin Dahl, Arizona program manager for the National Parks Conservation Association is quoted in today's Tucson newspaper as saying, “Five million people visit the Grand Canyon every year. What if the water had arsenic or uranium in it? Every visitor would have to bring in his own water." Sorry, Kevin, but the Colorado River has been eroding uranium, arsenic, and many other natural elements from its watershed and transporting those elements through the Grand Canyon since it began to form millions of years ago. The US Geological Survey has been monitoring the waters on the river for decades. A study we did here at the Arizona Geological Survey (Spencer, J.E. and Wenrich, K., 2011, Breccia-pipe Uranium Mining in the Grand Canyon Region and Implications for Uranium Levels in Colorado River Water. Arizona Geological Survey Open File Report, OFR-11-04, 1 appendix, 11 p) found the Colorado River carries an average of 60 tons (yes, tons - 120,000 pounds) of uranium every year through the Grand Canyon. The range is 40-80 tons per year, depending on runoff, rainfall rates, etc. The University of Arizona Superfund Research Program has released a preliminary report on "Understanding the Gold King Mine Spill" that includes calculated estimates of each of 24 minerals/elements that were in the 3 million gallons of mine waters from that mine. The also list the amounts of uranium, arsenic,cadmium, and lead (above). 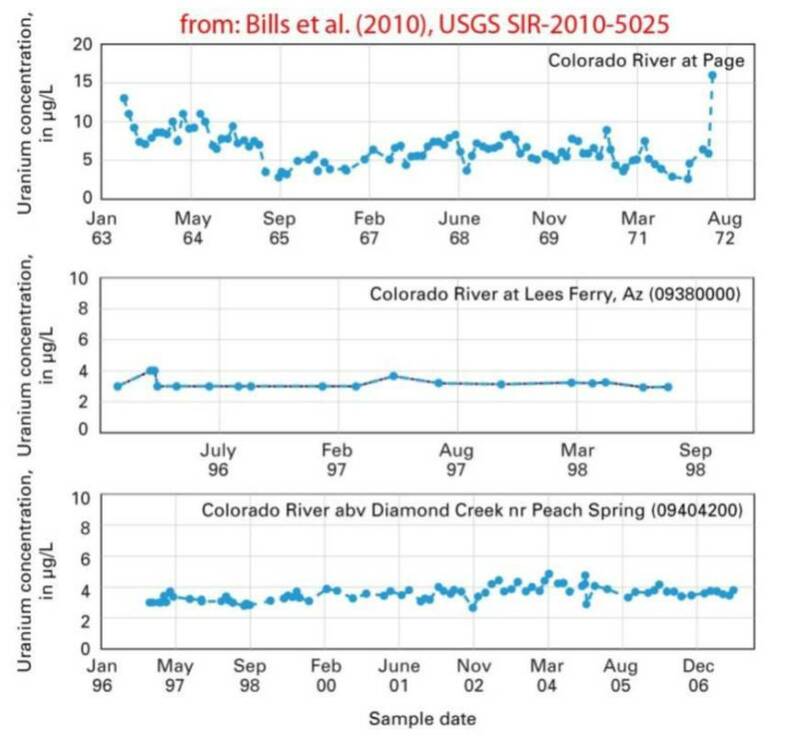 All are naturally-occurring in the Colorado River, but well below drinking water standards. The Colorado River drains a vast area and even normal levels of uranium and other minerals are enough to add up to large amounts when concentrated by the rivers. On top of that, northern Arizona has among the highest concentrations of uranium in the world, which also erode into the rivers and groundwaters. So, before panicking visitors to Grand Canyon and other recreation sites along the Colorado River system, we need to look at the base levels already in the water and sediments. The Colorado River carries uranium and arsenic naturally at low levels through Grand Canyon. Any increases from the Gold King Mine spill are well below drinking water standards. We have 50+ years of data to examine to help visitors and residents understand the significance and impacts of what is actually a relatively small addition of minerals to the river and canyon. You are probably familiar with the recent Gold King Mine waste water spill in Colorado and the resulting chorus of calls for cleaning up abandoned mines across the West. As part of this month’s Arizona Mining Review, our online video magazine, we interviewed Gail Heath, Research Scientist at the University of Arizona, with an expertise in remediating acid mine drainage. He presented a really elegant, efficacious, and cost-efficient solution to managing the region's growing acid mine drainage problem. The broadcast was posted to our YouTube channel - https://www.youtube.com/watch?v=Qu_zzesfxW0 The interview with Gail runs from 7:44 minutes to 19:30 minutes. EPA: Gold King Mine blowout "inevitable"